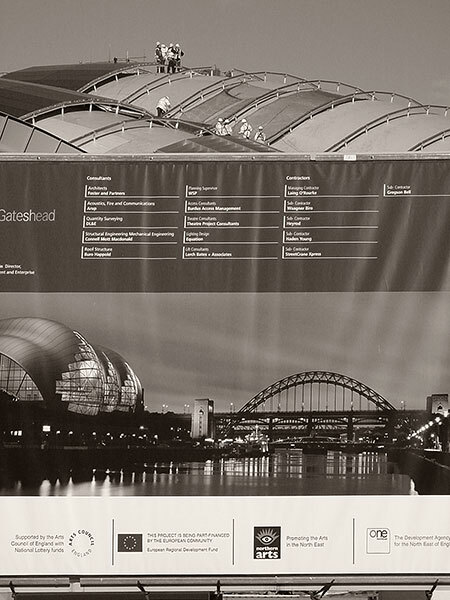 PHOTOGRAPHS 2003 TEXT 2014 | The SAGE GATESHEAD stands high on the southern bank of the River Tyne. 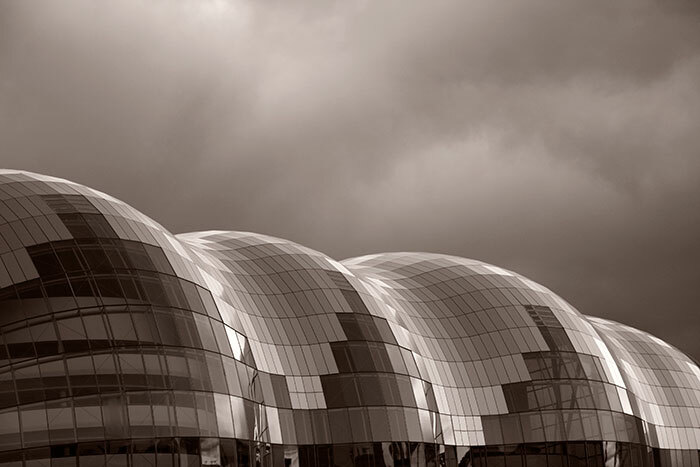 The wide expanse of glazing concentrated on its curvaceous northern façade reflects details from the rich range of architecture on the Newcastle shore. 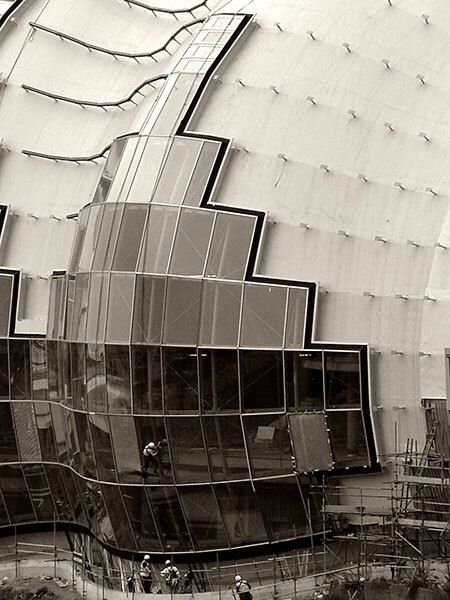 This image shows the installation of the building’s stainless steel outer skin beyond a large billboard carrying a perspective of the completed structure and six of the seven city centre bridges across the river. 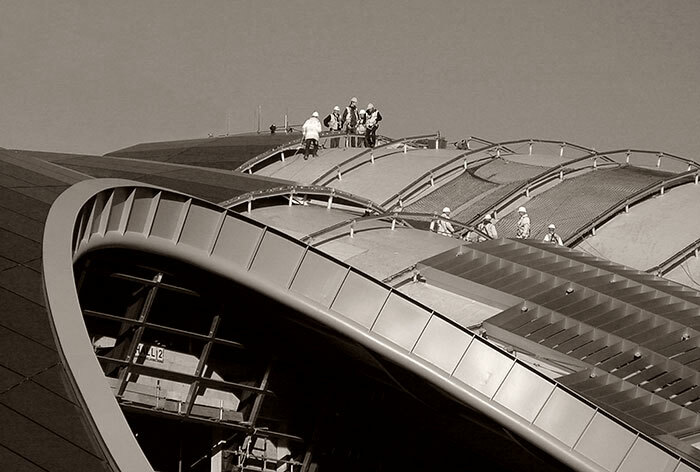 Foster + Partners began design studies in 1997 and construction was completed in 2004. The steel and glass roof soars over the concrete structures housing three principal performance spaces and a Music Education Centre. 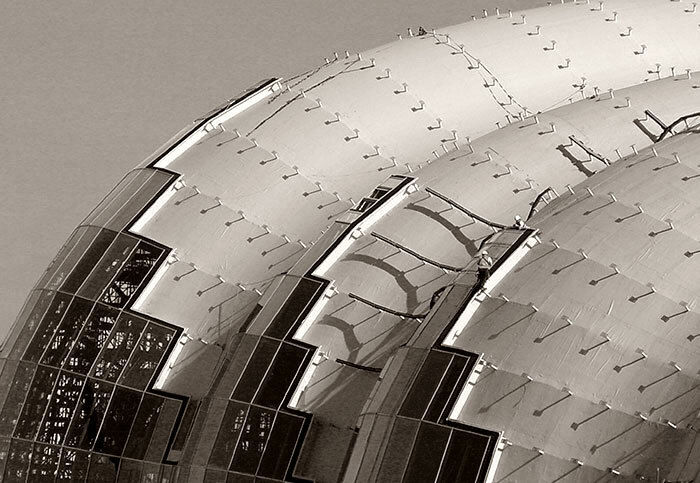 A voluminous concourse runs the length of the building behind the undulating façade. Very much a welcoming social space, its high setting offers spectacular cross-river views. It’s also used for informal music-making sessions. 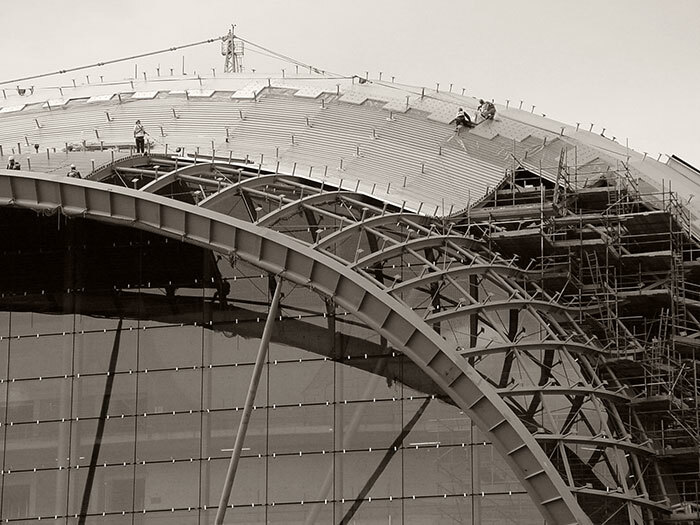 The seemingly three-layer inner skin installation is creeping over the remaining open steelwork of the east roof. The short posts will fix bars to carry the outer stainless steel panels. 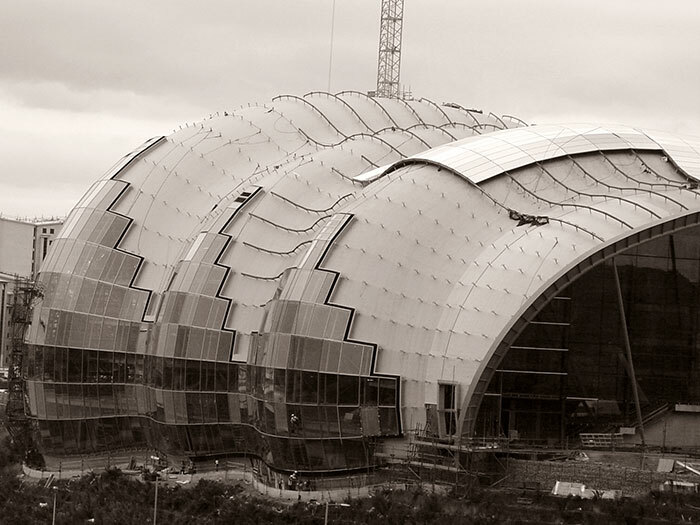 The three performance halls are structurally separate and insulated from one another to eliminate noise transfer. The timbered interior of Hall One, the largest, is a visually fine and physically comfortable auditorium: its acoustic design attracts high praise. 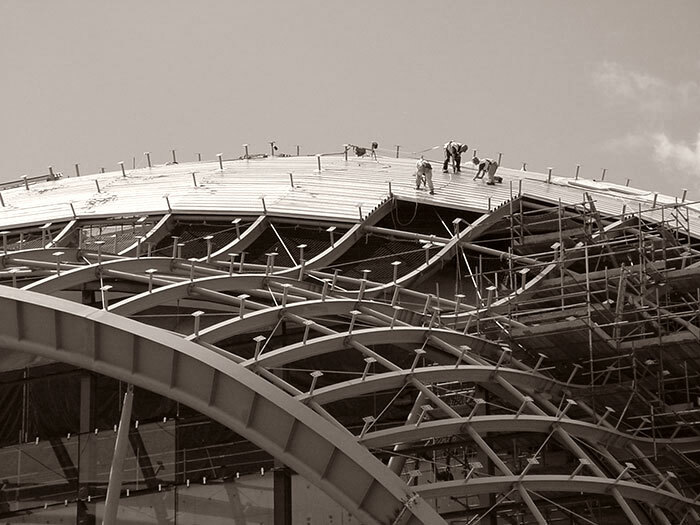 The changing curvatures of form within the roof and its component parts required much more creative design and build solutions than a more conventional structure. 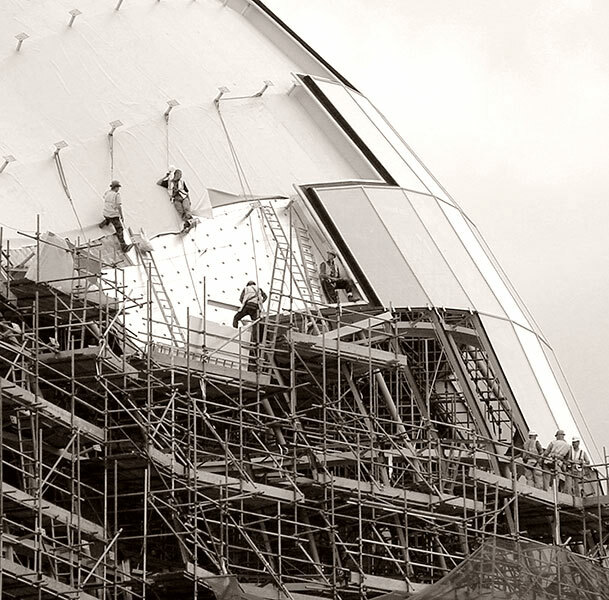 Intricate internal and external scaffolding stood in contrast against the heavyweight steel skeleton and the roof layers under the final stainless steel panelled outer skin. 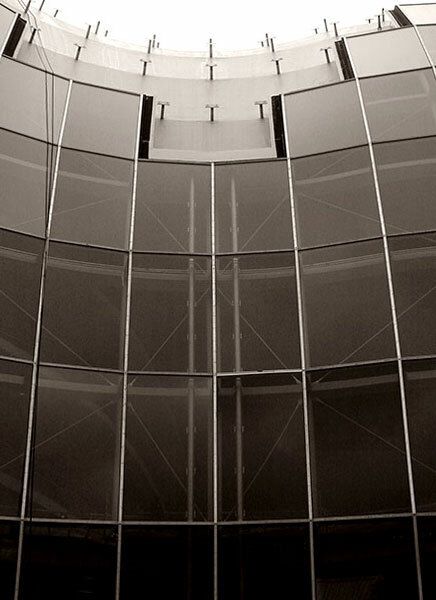 The ends of the building are closed by flat glazed screens. A staircase to upper levels is set within each and beyond those the concourse and core buildings are clearly visible. 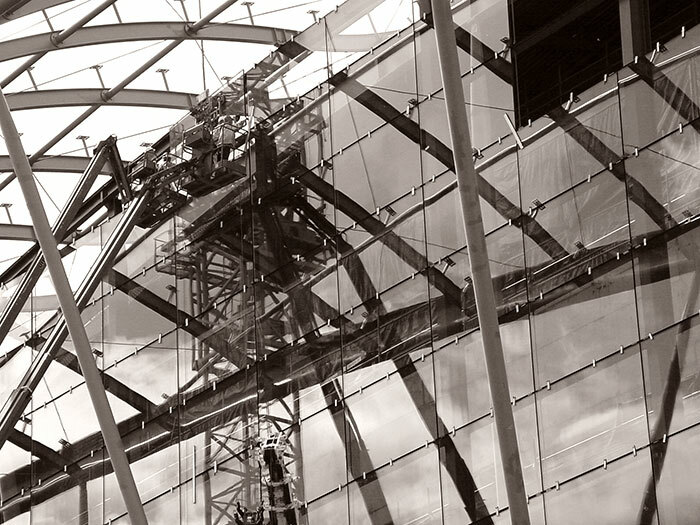 Here, hydraulic working platforms aid the installation of sheet glass into the minimalist supporting frames. 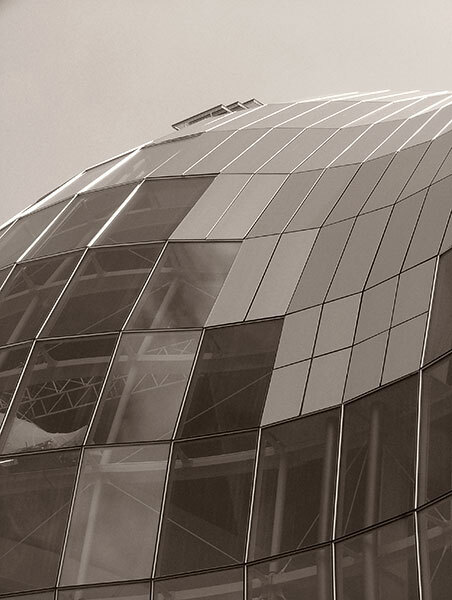 The glazing here and on the undulating river façade carry fragmented reflections of clouds and architecture. A hint of the scale of the building is given by the construction workers moving amongst the steel work. 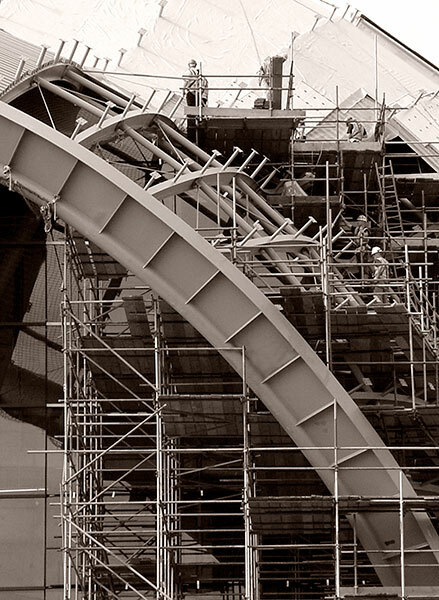 The complex scaffolding structure stands both inside and outside the skeleton. The initial layer of corrugated steel panels has been covered by thick slabs of insulating material to which a flexible waterproofing layer is being added. Workers are standing on and attached to posts which will carry supports for the outer stainless steel skin. Abseiling constructors were a working feature in these later stages of construction. 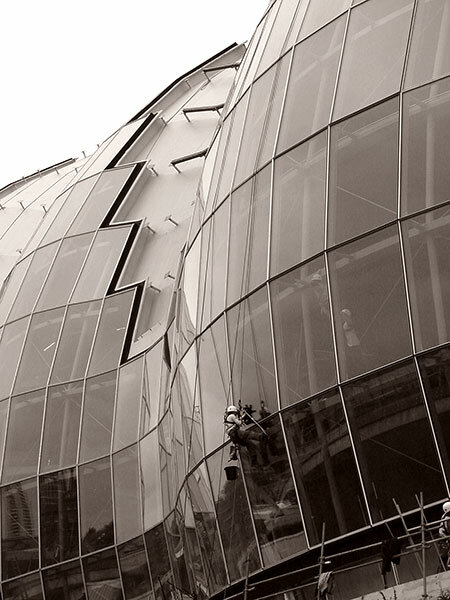 The installation of the glazing on the river facade and the two end screens was completed in advance of the outermost skin. The rows of posts and the first of the crossbars supporting the panels cast late afternoon shadows. 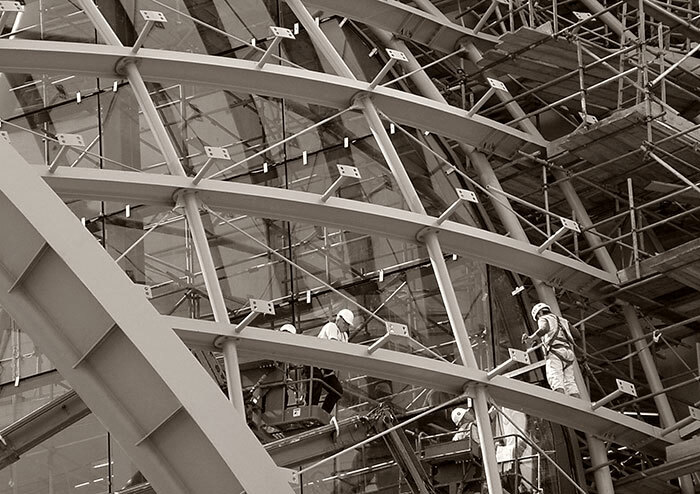 The steel panel installation activity spread from the sloping rear of the roof structure to contact the river façade glazing. Set low below The Sage, Hillgate Quay runs east from the Swing Bridge to the Millennium Bridge, the Baltic Centre for Contemporary Art and points east along the riverside. 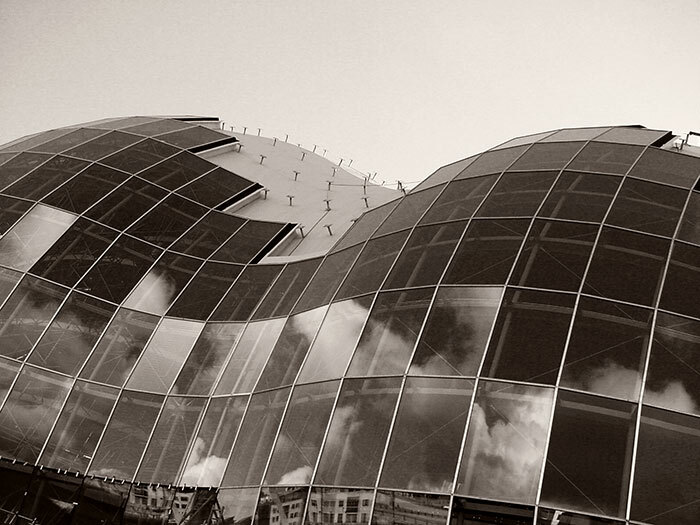 Walking by, the Sage glazing offers changing reflections of the Newcastle architecture and the clouds above. 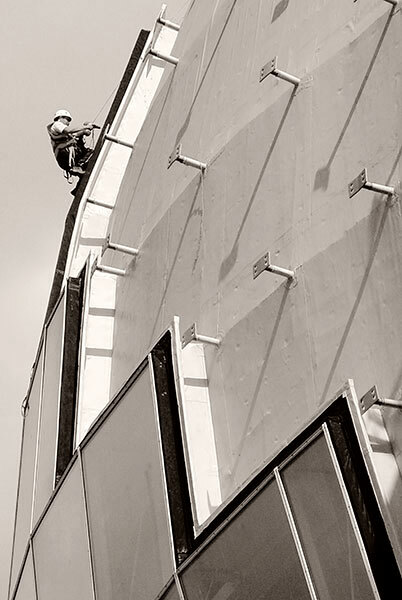 An abseiling worker and companions work on the façade glazing. During construction the interior seemed ill-lit by daylight with brighter areas created by temporary lighting. The ever changing light interacts with the facets of glass and steel to create a wide array of colours. Sunlight on the buildings across the river enhances the patchwork of architectural reflections running the length of the glazing. Photographers concentrate on the river façade and perspectives incorporating the end screens but largely neglect the rear façade. This U-steelwork is set behind the Hall 2 performance space and a similar but narrower form backs the smaller and centrally set Rehearsal Hall. The principal Hall One is backed by a nearly perpendicular steel arch. An adjacent car park stands above on the substantial stone arches built c1839 to underpin the Oakwellgate terminus of the Brandling Junction Railway. 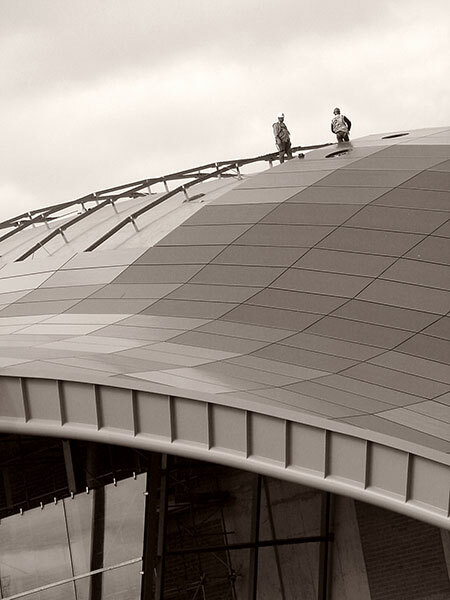 In late summer 2013 a number of roof walks were offered, sharing the city views these men saw day by day. These are some of the first images made after a move to digital photography following the failure of an elderly film camera. It marked the point where my interest in the medium deepened and the prototype of this website emerged. Sepia versions of the original photographs evolved in 2014. Such is the wisdom of hindsight, I regret not planning a more organised and extended study of the roof under construction.